Leigh Creek Energy’s demonstration plant on the old Leigh Creek coalfield in the Telford Basin, some 600 km north of Adelaide. SHARES IN LEIGH CREEK ENERGY soared 30 per cent in heavy trading on the Australian Stock Exchange on Wednesday, March 27, after an announcement that the company is probably sitting on gas reserves greater than those in the Cooper Basin. Based on the recent sale by Origin Energy of its Ironbark project in Queensland, Leigh Creek’s reserves could be worth more than $2 billion. 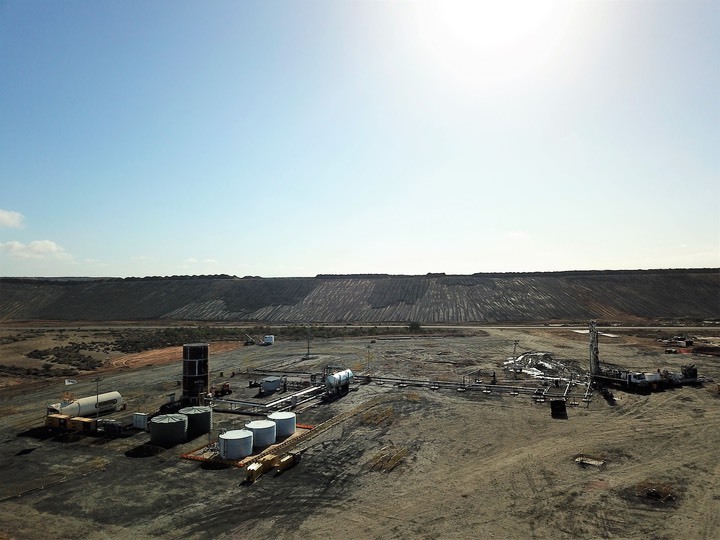 The announcement follows weeks of exploratory drilling following the successful completion of an underground coal gasification pre-commercial�demonstration project�(PCD) in January. 2P reserves are the total gas that the experts are at least 90 per cent sure can be recoverd (“proven” reserves) plus the gas that they are at least 50 per cent sure can be commercially recovered (probable reserves). The company, which initially hoped to have enough gas to supply fertiliser manufacturers, is now confident that it has enough to sell gas directly to the east coast as well as supply feedstock for fertiliser. Phil Stavely, managing diretor of Leigh Creek Energy, said the company was negotiating with more than a dozen gas purchasers who were seeking “a material amount of gas supply”. At the same time, it was progressing with a scoping study of a “compelling fertiliser strategy”, he said. Depending on demand, the company could operate as many as 20 syngas-producing chambers in the coal seams , generating gas for 20 years. The reserve estimate is expected to be upgraded in the light of further exploration. Shares in Leigh Creek Energy (whcih trades under the ASX code of LCK) have been rising steadily since March 14, when they closed at 20c. The following day nearly 7 mln shares changed hands, roughly three times as many as usual, pushing the price up 15 per cent. �On Wednesday 27, in response to the announcement, a massive 38.7 mln shares were traded, with LCK closing at a record 41c. Immediately the following the success of the demonstration project in January, the company invited shareholders to buy more shares at 12c a share — one new share for every 15 they held already. The potential upgrade in the reserves was well flagged by the company in a statemet to the stock market in February, two days before the closure of its share purchase plan. Those investors who subscribed to the offer of new shares at 12c each are now very happy campers. The share offer increased the company’s total number of shares to 514.3 mln. �Using the Ironbank sale as a measure of the potential value of Leigh Creek reserves, LCK shares �could, as a very rough calculation, be worth approximately $3.90 each if the company were sold tomorrow.